Come help us craft for a cause and make hats, scarves, and blankets for the needy! No sewing skills necessary for you to lend a hand. Please also join us for Shabbat services and any or all of our other activities! 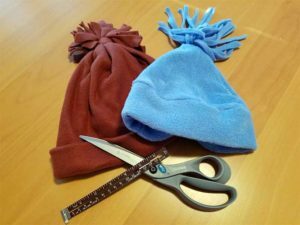 Winter is still here—come to the Temple to make warm hats, scarves, and blankets for those who are out in the cold. We have yarn and fleece. No sewing skills necessary to make fleece ​blanket and scarves for the needy. Rabbi Sparr will be available​ for office hours by appointment. Kindly contact her. No Religious School February ​19 and 26 because of school vacation week. The Board meeting scheduled for February 9 has been rescheduled to February 23 at 7 pm. All TEMV members are welcome. Besides being a fun night of socializing and listening to music, ​this is a TEMV fundraiser. What will you donate to the auction​?​ Possibilities are limited only by your imagination. Past donations have included: window washing, dinner for four, home baked goodies, gift baskets, vacation home for a weekend, professional services, mystery envelope, bridge lessons, gift certificates, babysitting. Contact Phebe or call 978 256-2855 to volunteer, solicit donations from local businesses, or​ if you wish to perform​. You may also use this form and drop it off at TEMV along with your items.